Box has launched a new program to better tailor its cloud storage and file sharing service to specific vertical industries. Box is developing a workflow engine for its cloud storage and file sharing service that will automate the routing of documents and files, as well as the actions that people need to take on them. Box Workflow, slated for availability next year, is yet another attempt by the company to extend the functionality and value of its core cloud service beyond storage and file sync and share for the workplace, an area where the 10-year old company has been a pioneer. However, Box finds itself facing strong competitors like Google and Microsoft, which are trying to capitalize on businesses' enthusiasm for this type of service and which have a broader stack of complementary collaboration and productivity applications to go with their respective cloud storage products. As competition heats up, the price of cloud storage has plummeted and become a commodity. As a result, Box for the past several years has been actively branching out and extending the features of its service, which, according to the company, is currently in use at 240,000 businesses by 27 million employees. With Box Workflow, IT administrators will be able to set up rules within the system that will be triggered automatically for specific types of files, documents, folders and data. For example, they'll be able to configure rules for contract approvals or invoice reviews that will steer the documents involved through a set of predetermined steps and actions. Box Workflow will also tap into machine learning algorithms that will give users recommendations for other relevant content to review, as well as automatically classify documents based on similarities to others. The engine will also have open APIs so that it can be integrated with third-party software and systems. "Box Workflow is rules based, intelligent and built on an open and extensible platform," said Annie Pearl, a senior product manager at Box, during a keynote at the company's BoxWorks conference in San Francisco. At first, Box Workflow will support rules based on value, time and logic elements, but the company plans to expand those options. "We're reimagining business processes in the cloud," said Aaron Levie, Box's CEO and co-founder, during the keynote, which was webcast. Another way in which Box is attempting to boost its standing as an independent vendor among giant rivals is with the launch of Box for Industries, a new program aimed at tailoring its products for the specific, vertical-sector needs of its customers. Box has identified a dozen vertical industries it plans to target, but will start with retail, health care and media and entertainment, three sectors where it has many customers. In fact, Levie was joined on stage at different points by Dreamworks CEO Jeffrey Katzenberg and by IT executives from Barneys New York and from Stanford Health Care. 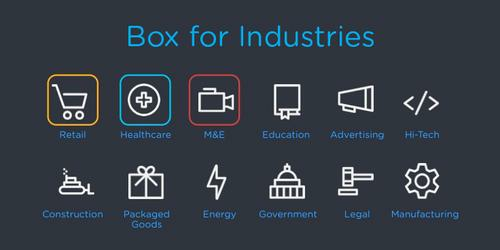 Box for Industries will combine Box technologies, third-party applications for specific industries and implementation services from Box and system integrator partners, including Accenture. Levie also announced the launch of the beta testing period for the previously announced integration between its service and Microsoft's Office 365 productivity suite. The integration will let users open, edit, share and save files from Box within Word, PowerPoint, Excel and other applications. Box is also working on an integration with Outlook, to let users share links to files stored in Box and turn document attachments into Box links within the Outlook interface. Box is also integrating its product with Office Online, the lightweight, Web-based version of Office, and with the cloud versions of the SharePoint, Lync and Exchange servers. Levie encouraged the about 5,000 attendees at the conference to reach out to Microsoft CEO Satya Nadella via Twitter to convince him to make Box a cloud storage option for the Office suite on the iPad. Box also announced an upgrade for Box Notes, its lightweight note-taking tool. The app, which can also be used also for simple project planning, group task management and individual to-do lists, will soon support the creation of tables and will feature version history, so that users can review previous drafts of a document. Box Notes, announced last year and rolled out to all customers in May, has been used for 600,000 hours so far, almost half of the time from mobile devices, Levie said. Meanwhile, Box plans to also add the ability to annotate documents the users call up via its desktop browser viewer tool, which supports more than 100 file types. The Los Altos, California, company, which has about 1,000 employees, closed its fiscal year on Jan. 31 with revenue of $124.2 million, up 111 percent year over year, and a net loss of $168.6 million, compared with a net loss of $112.6 million in the previous year. In its IPO registration statement, filed in March with the U.S. Securities and Exchange Commission, Box said it doesn't expect to turn a profit in the foreseeable future. In that filing, Box said that only 7 percent of its then about 25 million end users paid for the service. One of those paying customers is GE, which announced in May its plans to roll out Box to its 300,000 employees worldwide. Box has a free service option for individual users, and paid options for $5 per user/month, $15 per user/month and $35 per user/month. Asked by IDG News Service in July when Box planned to go public, Levie said the company is waiting for the right time. "We'll do it when the market is ready," he said then. The company recently closed a $150 million funding round.